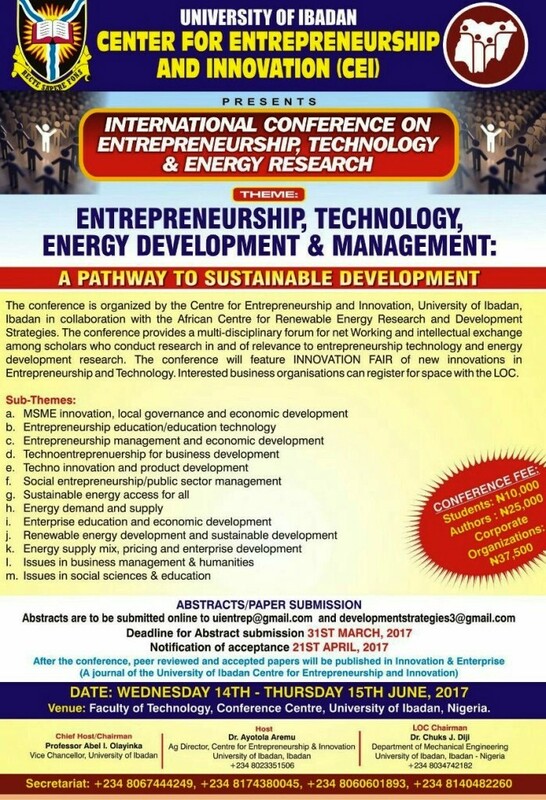 THEME: Entrepreneurship, Technology, Energy Development and Management: A Pathway to Sustainable Development. DATE: Wednesday 14th – Thursday 15th June, 2017. The conference is organized by the Centre for Entrepreneurship and Innovation, University of Ibadan in collaboration with the African Centre for Renewable Energy Research and Development Research. The conference provides a multidisciplinary forum for networking and intellectual exchange among scholars who conduct research in and of relevance to entrepreneurship, technology and energy development research. The conference will also feature an INNOVATION FAIR of new innovations in Entrepreneurship and technology. Interested business organizations can register for space with the LOC. Workshop for Early Career Academics in Entrepreneurship.